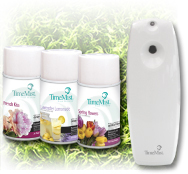 » DUAL ODOR ELIMINATOR - TIMEMIST'S DUAL ODOR ELIMINATOR FOR COMPLETE DUAL ODOR CONTROL! Enter your email address below to recieve updates on our product specials. FRESHEN YOUR SPRING AIR WITH THESE SENSATIONAL SCENTS FROM OUR TIME MIST COLLECTION.